In “Sports Psychology Sessions with Doc,” Dr. Patrick Cohn answers a question from Alex who can’t get comfortable when standing over the ball. Do you tend to stand over the ball on the golf course and just never feel comfortable enough to pull the trigger? 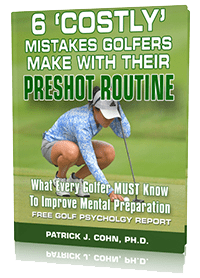 What causes golfers to freeze over the ball? A question from a golfer who tends to get a little trapped over the ball and has trouble starting the swing. This tells you that he really doesn’t have a well defined routine. What are the breakdowns in your routine and what can be causing that?